Disclaimer: I was given the product in this post for the purpose of review. I was not paid to write this review. ALL opinions are my own. You shouldn't let your kids sleep in your bed when they are scared, you will make them to dependent on your love.... If they wont stop screaming throw water in their face it will shut them up..... Lock them in a room if they get out of hand..... Make sure your voice is always the loudest in the room... (And the worst by far) sometimes you just got to hit them to let them know who is boss. Dear Readers as I am sure all of you are or were, I too have been the victim of bad parenting advice. The ones up top are the ones that stuck out the most to me through my parenting journey and quite frankly a few of them even scared me. Those stick out because lets admit it they are crazy! I mean who would throw water in a child's face!?! As a little girl my dad hit, a lot. I use to go to school covered in black&blues. Terrified to ask for help, because I thought even that would get me another beating. I lived in fear. My parents were always fighting and breaking things and to often my brother, sister and I were caught up in the carnage. After years of self work I forgave my parents and today I have a healthy relationship with both of them. Because of my up bringing though I was scared yet again that I would in some way damage my kiddos. That they would live in fear too. I was so upset I talked to a friend about it. And after all the bad advice I had gotten from others she gave me the best advice possible. God. She said "God, Savannah he is your answer. Put your love and faith in him and the rest will come naturally." And she was right. Don't get me wrong some days I yell or over react. I feel horrible about it. I pray and through prayer I realize I have to tell my boys sorry that I messed up. Being a parent isn't black and white. There is no easy answers and most of the time we are just stumbling about praying with our fingers crossed that we got it right. Don't fret parents we all do it! 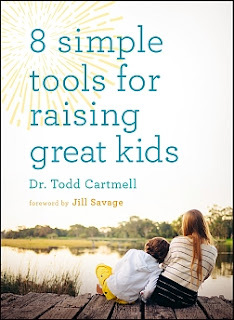 When I seen the book 8 simple tools for raising great kids I just knew I had to have it. A book that gives us an alternative to yelling! That helps us connect and teach our kiddos the right way. And again don't get me wrong it takes work, this doesn't happen over night. But this book was a huge eye opener to a few things I was doing wrong and simple ways to fix them and do them better. I don't want to give away to much of the book, but one of my favorite sections was "Family Time" I am 28, my hubby is 31, my oldest is 8 and my youngest is 5. Sometimes it can be tough to find something we all want to do. This book gives us some easy choices! Another great one that I want to add is plan out the family vacation. We are going in June and we spent all of Saturday night planning our trip and talking about what we wanted to do and see when we were at the beach!! This is just one small exampleof the lessons and tips from the book. The entire book is filled with ways to grow closer as a family. My family, they are the most precious thing in my life. The greatest gift God has ever given me. I want to do it right, I want my boys happy and healthy. This book helps me, it makes taking that journey a bit easier.